Adapted from Curtis Bauer, The Common’s Translation Editor, and Director of Creative Writing Program and teacher of Comparative Literature at Texas Tech University. What is your first encounter with this magazine, as an object? What do you think about the physical and aesthetic features of the magazine: the weight, the paper stock, the cover, the cover art, the font? What, if anything, would you change? How do you read it? In order? Piecemeal? How do you think this affects your reaction to the magazine? How do pieces (poems, essays, stories, images) relate to each other? What is the effect of their placements on you as a reader? Asking students to create homages to several of the works in The Common Issues 01 and 07 promotes a further exploration of the city in which they live. In fact, it requires it of them. In Issue 01 of The Common, Ted Conover delivers an immersion essay in which he delves into the past and present of a nearly forgotten road near his home in New England. The first prompt of the semester, therefore, compels the students to write their own Conover-esque immersion essay by walking/exploring a street, building, or landmark in their city or town, seeking out written resources on this place, and gathering up the courage to probe living memory. The second prompt, handed out several months later, encourages them to become creative with what they have so far discovered in their town or city by selecting the works that most interested them inThe Common and emulating these. Choose an essay from The Common and prepare and deliver an oral report in class on the piece, focusing on an aspect of craft: research, voice, style, place, point of view, and the development of the “I” character, as well as characterization of other characters in the piece. 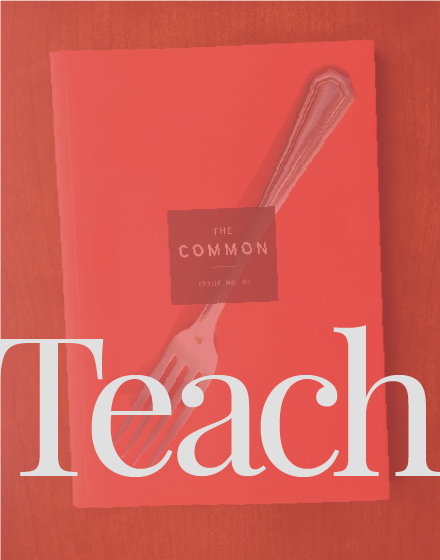 Assignment: Report on 2 Issues of The Common; select and discuss various, particular elements of the literary journal. 6 pages (1,800 words) minimum.